The last update I wrote about our tiny home living was at four months. Here we are going into our fourth year! I feel we are long overdue for an update. It’s been so long in coming partly due to the fact that I truly thought we would only be here one year, two years at the most and partly due to procrastination. Lillian is in her senior year of high school (as a homeschooler). We’ve published two books. Thomas reached the teenage years. I embraced, processed and released a TON of old wounds and deep shadow work. Mom and Frank (The Romano Duo) moved away for 3 years and ultimately moved back this past summer (2018). I’ve gone on over 50 dates with Thomas and Lillian combined (as I have a date with each of them once per month). This just touches the surface of all that we’ve experienced. I will expand on each of these below weaved within the living in a tiny home update. 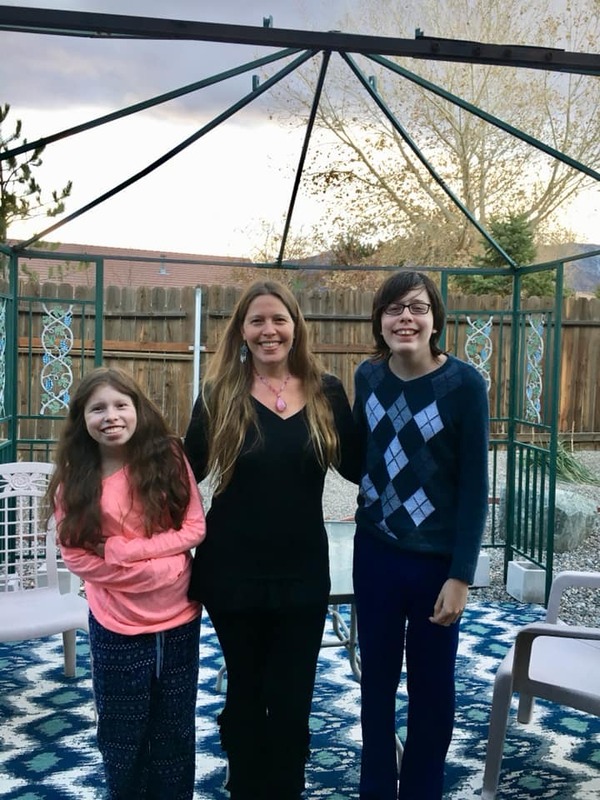 A great deal has happened since the four month update and more than a few factors that have us still living in this tiny home – an 810 square foot 1 bedroom/1 bath condo (for anyone new here: “us” is myself and my two kids, 17 year old Lillian and 13 year old Thomas. We call ourselves Team TLC to correspond to the first letter of each of our names). In July and August 2017 I packed our things thinking we would be moving. I reserved a moving truck, a storage unit in case we needed it, and gave our 30 day notice. However, shortly after we moved here in August 2015, Reno began to experience a population boom. Rents began to increase and affordable living space disappeared as more and more people moved to the area. As hard as I tried, I could not find another place, that at least had a 2nd bedroom, and that was also not a significant increase in what I am paying here. The management had already told me that they would allow me to back out of the 30 day notice as I had been telling them I could not find another place. Just a few days before we were to move, I found the perfect place for us. It was a 2 bedroom/2 bath and just a tad bigger than this place. Fortunately, I was the FIRST person to call on the place and to see it. We went to look at it and the property manager said he had over 50 messages and I just happened to be the first to call. Well, my income is not easy peasy, here’s a copy of my pay stub, and my credit score is still trashed from the divorce and bankruptcy. So, it was pretty easy to turn me down with more than 50 others waiting in line. The day before we were to move, I had to decide if we were going to move out with no where to go or if we would stay here. I discussed it with Thomas and Lillian and we all decided we wanted to stay here. Thomas was devastated that we did not get the other place. He strongly desired to have a room of his own where he could have privacy (and escape when Lillian fell into a meltdown). I was disappointed also as I know these two would like their own space (with a door!!) and having a second toilet would be absolute heaven with 3 people in the house; with one having special needs and NO flexibility when she is using the toilet and others are waiting! I LOVE the size of this place. However, I STILL do NOT like the near constant traffic noise and it saddens me that being here is causing unhappiness for Thomas and Lillian. When it was clear we would be staying here in August 2017, I was determined to give Thomas and Lillian their own space in the best way I could, even though we only have one room (the bedroom) that has a door. Well, other than the bathroom! I decided to move Thomas’ furniture out of the dining area into the bedroom and I moved my bed into the dining area. That was no easy task as I have a queen size tempurpedic bed. Those things are like moving a 500 pound slab of jello!! Thomas and I had a heck of a time getting that sucker moved. I called upon my inner Incredible Hulk with deep grunts and screams to get that damn thing moved. I had already sold my dresser and the bed frame. So, we only had to move the bed and nightstand out of the bedroom. After getting my bed out, we moved Thomas’ furniture in and had to rearrange some of Lillian’s furniture. We have a 3 or 4 person tent so I put that up for Thomas on his side of the room. It took up more room than I had anticipated so after a few months I chose a different solution. After taking the tent down, I made a “wall” dividing the room by using 2 bookshelves, packed boxes, and curtains. I chose not to unpack some things in anticipation that we would move into another unit. This is still how we’ve got it arranged to this day. It’s a bit more cramped than previously as I still have things in boxes. Partly due to stubbornness as I want to move us and partly due to not wanting to pack things again when we do move! This past August 2018, we repeated nearly the same scenario as the summer before. I began packing and searching for another place. It was even worse this time around. I searched right up until the day before we were to move. We sat down and discussed our options; which were to either stay here or move our things into storage and then find a place to live. Thomas and Lillian absolutely did not want to do the latter. The choice was made to stay here. Near the end of 2016, I began deep personal and internal work on myself. This lasted throughout 2017 and 2018; culminating in December 2018 when I reached my tipping point and had an intense spiritual experience. I won’t go into details in this post; yet, if you take a walk through the blog posts for 2017 and 2018, you’ll get an idea of how intense. I am renewed. I am reborn. I am healed (or as a friend commented in a recent performance, “You are healed, baby-child. You are healed.”) I am ready to begin again. While I feel there will always be little pockets of healing to address; I also feel I addressed the deepest of the deep past wounds. I am and will be steadfast at moving us from this unit or this condo complex by the time our lease expires in August 2019. Steadfast is my 2019 word and I will apply it to many things that have not been addressed and focused on since 2016 and beyond even that. This is also to include writing (being paid for writing, that is, as I will always write), mentoring others, unconditionally loving myself, Thomas, and Lillian, and working towards bringing to life the experiences each of us would like to have. What began as a fun adventure has reached it’s ending point. Thomas doesn’t mind the size of the place. He simply has a strong desire to have his own room with a door, no matter the size. Lillian would like a larger place and she has a strong desire the same as Thomas … for her own space. I LOVE the size of this place. I have no strong desire to have my own room. If I have one, that’s fine. If I don’t, that’s fine too. All three of us would be grateful for a second bathroom, at least a second toilet, anyway. Tiny home living as a family is not for the faint of heart. I can see how it would be a breeze for a single person, a close knit couple, or a single parent with one child. Maybe even a couple with one child. But, two kids with only one bedroom, gets tricky as they get older. Much easier when they are young and still having fun together. I still like it here and have gotten used to the traffic noise. It’s kind of like background noise now. I also want another bathroom and at least one more bedroom. I would absolutely make this choice again. With one slight adjustment of holding firm to NO street noise. It will take me years to recover and to lose the constant ringing in my ears; from the noise and from wearing ear plugs to be able to sleep. I am very done with the street noise. What can I say? We moved in August 2015. We were incredibly happy to have a place located where we wanted to live. We were (and are) deeply grateful and blessed to live in such a beautiful place, with amazing amenities, along with the gorgeous lil lake and walking trail. I blinked. Now it’s January 2019 and this adventure has reached its end. Stay tuned as the adventure begins to shift … Steadfast! !